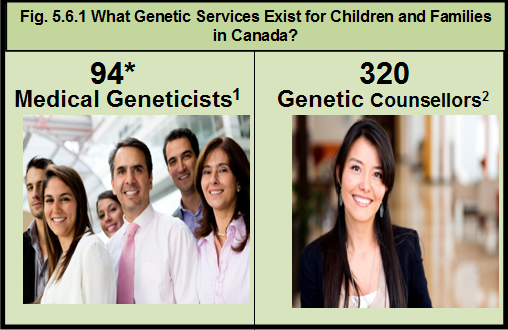 Home Modules Module 8 Section 5 What Genetic Services Exist for Children and Families in Canada? *This number reflects the medical geneticists working at 16 of the 17 academic paediatric health centres in Canada. Medical geneticists working at the Northern Ontario School of Medicine or in non-academic paediatric health centres were not included in this count. Source: CICH graphic created using data adapted from The Canadian Medical Residency Guide. Medical Geneticists in Canada. 2015. https://www.cma.ca/Assets/assets-library/document/en/advocacy/Medical-Genetics-e.pdf -accessed July 25, 2017 and Canadian Association of Genetic Counsellors. (2016). Membership directory. https://www.cagc-accg.ca/?page=125 -accessed July 25, 2017. Genetic services are organized through genetic clinics across the country that employ interprofessional teams of healthcare providers. Two important providers on this team are medical geneticists and genetic counsellors. There are approximately 94 medical geneticists in Canada1; most practice in British Columbia, Alberta, Ontario, and Quebec, but they are found in other provinces as well. The majority are in academic centres, but they provide outreach to smaller cities, as well as rural and remote areas. Alongside these genetic services, there are a number of community-based organizations in Canada that focus on providing support and education to families with a genetic disorder. The Canadian Directory of Genetic Support Groups (http://www.lhsc.on.ca/Patients_Families_Visitors/Genetic_Support_Directory/-accessed July 28, 2017) lists 78 Canadian organizations offering such support. The umbrella organization, the Canadian Organization for Rare Disorders (C.O.R.D.) (http://www.raredisorders.ca/ -accessed July 28, 2017) provides overarching support and advocacy for many genetic disorders. Of the genetics services available, laboratory services are a central component. All academic pediatric centres offer cytogenetic, molecular, and/or biochemical laboratory services; however, these vary from centre to centre. 2Canadian Association of Genetic Counsellors. List of Certified Genetic Counsellors. July 2016. https://www.cagc-accg.ca/?page=125 -accessed July 25, 2017. Since genetics is a rapidly evolving clinical field, patients and their families are confronting increasingly complicated issues in their healthcare. There are many genetic conditions which require screening, diagnostic services, and counselling and support. Whether it be about genetic testing, screening, or a diagnosis, parents and children, will have many questions and need specialized care and support.